We found happiness from the recipes of The Find. If you are looking to find The Find, it is found nestled in Rochester Mall, in between The Star Vista and Rochester Park. The Find offers Italian-French cuisine at an affordable pocket friendly pricing, and also boasts a great wine selection. We started off with the Pan Fried Foie Gras with Arugula Salad, drizzled with honey balsamic dressing and served with homemade country bread. The foie gras was seared to perfection, along with the sweet and citrusy salad dressing. The pairing was perfect, we only wished they were a little more generous with the foie gras portion. We also think the nicely seasoned Mushroom Soup with chunky bits of mushrooms within, topped with golden crispy garlic croutons deserves a mention. As for the mains, we were served an amazing Braised Beef Cheeks with mashed potato, drenched in morel sauce. The beef was sous-vide for 12 hours to the extent the meat was fork-tender; there is no need for a knife - it literally melts in your mouth. The creamy mashed potato and savoury morel sauce also blended in so well with the tender beef cheeks. It might be a game-changer for someone who does not fancy beef. Another main from the menu which is a must-have is the Lobster Risotto, served with watercress and sundried tomatoes. The lobster was poached to perfection and served de-shelled making it convenient to indulge in. The risotto, a dish of rice cooked with broth and flavored with grated cheese was flavorful with bits of the lobster in it. A meal is not a meal without sweet desserts. For desserts, we had the Duo Panna Cotta with Honey Lemon Sauce and Pistachio. The panna cotta had two layers - the top layer made out of cocoa and the bottom layer was cream. The pairing was refreshing and we found ourselves enjoying the light and creamy texture from it. Overall, we feel that Chef Andre had done a really good job with his dishes. He balanced the flavors of the dishes well and chose simple ingredients and executed each dish with so much finesse. I guess we found a (worthy) find, indeed. Every festive meal should end on a sweet note, and Christmas never ever seems to be an exception. To us, the cake is pretty much as important as the turkey, and really, a bad cake could literally mean Christmas without being merry. Here's a few cakes we tried this festive season, alongside recommendations. Soft sponge, lightly whipped cream and a choice whether or not you want your dose of alcohol - that is what Bloomsbury Bakers has to offer this Christmas. Offering two flavours (Baileys Log and Speculoos Apple Crumble Log), the cakes are shaped in a stump instead of your mainstream logs which comes horizontal. The design is minimal, with a little extra touch from little fondant mushrooms and cookie crumbles surrounding which act like soil. The texture of the cakes were soft, light and honestly, very easy to down, even after a heavy meal. If festive means alcohol, jump right for the Baileys Log, and leave the Speculoos Apple Crumble one for the kids. If you are not at all a cream person, the fruit cake from Holiday Inn Singapore Orchard City Centre should definitely be on your list of cakes to eat this Christmas. Packed with lots of quality fruits and nuts, the whole cake is one that we label as calorie worthy. The recipe of the fruit cake comes from Australia's Celebrity Chef, Tony Bilson, who also collaborated with Holiday Inn Singapore Orchard City Centre to create their Christmas menu at Window on the Park. It comes in two version - with or without cognac. Kick or no kick, you decide. A perfect illustration of a log with a local twist is the Heritage Peranakan Log from InterContinental Singapore. Featuring a lime-coconut supreme with pineapple-ginger compote layered between pandan sponge and pandan kueh lapis, there is no reason to not fall in love with this delicious and light cake. The fragrant pandan flavour came through with each mouthful, and the sponge was pillow-soft - making it probably one of the best in town this year. If you like your log cakes rich, the Classic Chocolate Cherry Winter Log makes you feel as if you are indulging in a block of chocolate, literally. The decadent dark chocolate clearly is a perfect paring with the rum soaked cherries - a sinfully good cake, no less. Christmas is never complete without a panettone, and the ones at Marina Mandarin's Santa House is one we think should be part of everyone's Christmas. Their Panettone Veneziana promises a soft light fluffy interior packed with a generous amount of quality dried fruits, and a nice golden crumbly crust to top it off without making you feel like you've just had sugar overdose. Their log cakes this year include the Chocolate & Kumquat Compote Log, Durian Yule Log, Ricotta & Mascarpone Yule Log and a Mango and Passion Log. Apart from these, the Santa House also features a (not so edible) chocolate entrance and has tons of festive homemade goodies to offer. From the creators of the "best rainbow cake in town", the offering at Medzs this Christmas is no different, except with a lot more. Expect their signature rainbow cake in a form of a log (well, not really), topped with fresh berries and decadent dark chocolate. As usual, the cake is moist and dense - exactly how we think it should be. Not forgetting the gold dust on the berries that definitely adds on to the Christmas-y feel, we think this cake is one that will be a stunner on the dinner table. The season to eat and be merry is here once again. And of course with no exceptions, the list of places to eat at gets longer each year and the decision on where to eat once again becomes the question amongst friends and family. Here's a few places we tried this festive season, alongside recommendations. One for all - At Aquamarine this festive season, one can expect nothing but literally the best of everything. From fresh sashimi slices and sushi at the Japanese counter, to fresh seafood that will bound to leave you spoilt for choice. Featuring many different cuisines, you definitely won't be missing out on Singaporean favourites such as Bak Kut Teh and local favourites like Nasi Lemak as well. Oh yes, the dessert bar also offers countless number of desserts which we were glad we kept stomach space for. While the Christmas bells ring, you can savour their slow roasted turkey with cranberry sauce, stews, pasta and lots of other festive treats from the never-ending festive counter. We think this buffet is one you should not be missing out on and we suggest going on an empty stomach. By the way, log cakes included! Communal dining - A whole turkey, oven roasted crispy pork are just some dishes Medzs will be offering this festive season. The Mediterranean Spice Infused Whole Turkey stuffed with Foie Gras and Chestnut features a perfectly cooked turkey, tender and juicy within with a generous amount of stuffing - exactly how christmas should be like. The Oven Roasted Crispy Pork on the other hand, was served with a biscuit-like skin that crackles on each bite, with well-seasoned meat underneath. And if you think that is all, they will also offer their normal menu with tons of different cuisines available. As i have always agreed upon, Medzs feels like a one stop place for almost everything, anything. Deck the halls - Miam Miam is the place to be at if you want to be all for the festive mood. With a fully decorated restaurant, you can expect snowflakes from the lights, and be all decked for the christmas mood. Even though they did not come up with a christmas menu this year, we reckon that their rave worthy Miam Miam Spaghetti from their 'made from scratch' menu will bound to leave you filled with contentment. Don't forget to dive in for their dessert - the Valrhona Dark Chocolate is a decadent treat worthy to indulge in this festive season - with dark chocolate overload. Oyster overload - With 150 different selections under one roof, the buffet at Momiji isn't to be missed this festive season if you are a fan of seafood. Under the seafood section, be amazed by a variety of snow crab, deep sea red prawn, sashimi and oysters. This season, Momiji will offer 7 different types of oysters done in different ways - teppayaki, fresh, grilled, fried and even shabu-shabu. Leave space for dessert with a DIY waffle machine promises to give you a golden crispy waffle, to be paired with a free flow of Haagen-Dazs ice cream. And of course, because it is the season to be merry, they didn't forget the free flow beer. They also run dinner and brunch on Sunday afternoons. Seoul Christmasy - A long awaited Christmas at Sync Korean Tapas Bar brings you the Halbi Jim - a 48 hour braised short ribs served with mash. The beef, done to perfection was medium in the center, tender and literally melts in your mouth, alongside the smooth mash. The Sweet Potato Croquettes came with oozing cheese filling, stuffed with chorizo and topped with apple salsa - you won't be stopping at one. Apart from those, their main menu also runs this Christmas, including the highly raved about Kimchi Cheese Fries, which was a perfect combination and balance of spicy and salty. Of course, not forgetting the creamy and minty soju mojito which compliments all their tapas dishes. Christmas at home - Expect lots of local dishes at Window on the Park this Christmas. Featuring the star of the buffet, their famous Laksa will bound to leave you going back for more (it is a buffet, after all). The flavourful yet not too thick gravy infused with prawns, bean curd puffs and thick bee boon is a star not to be missed at the buffet spread. Apart from it, their Christmas offerings include turkey, lamb and roasted beef sliced upon request. The highlights of the seafood spread include freshly poached prawns served chilled which were extremely fresh and sweet, as well another of their signature, the black pepper crayfish, which we went 'cray-cray' with with. They also serve a rich fruit cake, which recipe comes from acclaimed chef, Tony Bilson. The girls haven't been left out (well at least not just yet). It has been a year with lots of shaving with Braun, and the while the boys are fretting over what to gift for Christmas, the girls kind of got lucky this time. The women's beauty range from Braun promises no ugly women, only lazy ones. With products that one would find useful from head to toe, from hair stylers to epilators - it probably just means the Christmas list either gets long, or longer. One of its kind, the Braun Face is the world's first ever mini epilator (for usage on the face) and cleansing brush - 2 in 1. Suited for all skin types, including sensitive skin, the facial cleansing brush vows to cleanse better than manual cleansing. Bound to leave you with cleaner and clearer skin, it also aids to the extent of removing make-up. The mini epilator can be used for facial hair on the chin, upper lip, forehead and even to maintain your brows. Gender discrimination aside, this also makes a perfect product for a guy to use. The Braun Face retails for SGD99. Hairdryers are often known for leaving you with dull looking, frizzy hair all thanks to the intensive amount of uncontrollable heat that most hair dryers have. Well, not anymore. With the Satin Hair 5, the IonTec technology ensures that millions of active IONs are released to boost the shine and combat frizzy hair while drying. Boasting an even heat distribution and concentrated power, the Satin Hair 5 is portable, light and guarantees fast drying. It also comes with a professional style nozzle to help easily achieve a Hollywood A-list look. The Braun Satin Hair 5 retails for SGD99. Bid goodbye to bad hair days with the Satin Hair 7. This isn't just any ordinary styler, it comes equipped with the world's 1st SensoCare that feels your hair and adapts the temperature of the styler for ultimate heat protection. The built in sensors detect the moisture level of each hair strand and adapts the temperature, leaving you with the perfect style and healthy hair. With NanoGlide ceramic plates, the styler glides a lot smoother than other stylers in the market, making it an ideal (if not the best choice) of hair stylers around. Gadget or styler, you decide. The Braun Satin Hair 7 retails at a special price of SGD139 this Christmas. This epilator from Braun assures that even shortest hairs are removed effortlessly, leaving you with visibly refined skin. With technology instilled, it features a smartlight that will reveal even the finest hair and a high frequency massage system that actively stimulates you skin for gentle epilation. The multi-use epilator comes with 5 different head caps - an exfoliating brush head, shaver head, trimmer cap, sensitive area cap and a facial cap. This 'all-in-one' product can be used both in the shower (wet) or even dry. The Braun Silk-epil 7 retails at a special price of SGD189 this Christmas. That said, Braun settles it all from head to toe. And again, the phrase "there are no ugly women, only lazy ones", couldn't be more right. They always say Christmas gifts should be practical and useful - guess that also means a few ticks on the list for your mother, sister, girlfriend, wife or whichever friend you want to gift. Merry Christmas! This is a sponsored product feature. Nestled in the row of shophouses on Temple Street is Arterial. Despite it's traditional surroundings, this new addition to our cafe culture is no where near traditional. With a menu of "not so cafe" dishes and lots of communal dining recommended, we actually think this new kid on the block seems like a hidden gem waiting to be discovered. Good to share is the Grilled Asparagus, grilled and topped with butter. We enjoyed the fact that the asparagus remained crunchy and wasn't overcooked, and the aroma of the butter came through sustainably. Another crowd pleaser was the Chicken Wing Fries which were fried to golden perfection and came with a housemade garlic mayonnaise dip on the side. A really unique dish we think is worth a shot is the Pork Aspic Terrine, served cold with lots of bite, flavor and texture within. Our favourite dish of the lot however, was the Chicken Liver Pate which was absolutely divine. The liver pate had an extremely creamy texture without being overly salty and paired perfectly with the slightly toasted herbed focaccia. For mains, the Squid Ink Aglio Olio was served al dente, with quite a generous amount of squid and prawns on top - we found it a tad too dry for our liking, but the flavours came through and the seafood was fresh. Dessert lovers should not miss out on the Banana Coconut Parfait packed with fresh blueberries, frozen banana and lots of freshly whipped cream - a perfect ending to the meal. We also think the Mocha Cake with Coffee Glaze that was moist and dense is worth a try. Though a new kid on the block, we definitely agree that Arterial has a lot of potential, especially since it's currently being consulted by one of Singapore's top Mod-Sin chef, Shen Tan. Will we be back for more? Most definitely. A collaboration with Celebrity Chef, Tony Bilson from Australia known for his creation of mix classic French and modern Australian cuisine, along with the Tandoor’s Head Chef, Suri who travelled through Europe and Asia which inspired his extraordinary creations, Tandoor is the first fine dining restaurant to present authentic Indian cuisine with an alternate method of cooking. Tandoor will be featuring a selection of Tony Bilson’s creations till end January 2015. To tease our palate off to a great start was the Roomali Red Snapper Chaat - a Carpaccio of Red snapper with tangy chilli and lemon dressing. The lead of the dish was the fresh red snapper, and also shellfish and treasured caviar. As it is a seafood dish, to say that it is fresh is an understatement. If you find yourself scared of tasting fishiness from seafood, you most definitely have nothing to worry about. If one is a big fan of scallops, one must not miss the Tawa Scallop - an alternative starter on the menu. It is an Indian spiced pan-seared Norwegian scallop with saffron and fennel sabayon. The freshness and juiciness from the scallop melts in your mouth almost instantly. For mains, 4 selections are offered, including popular Australian wildlife. The Pathar Ka Bataer is a stone grilled quail served with butter-poached potatoes and Indian black pepper sauce which was simply amazing. The quail was served boneless, tender, succulent and cooked to perfection. If you are a white meat person, this is would be an excellent choice. Next in line is the Vilayati Sarson Gosht - a slow cooked Australian lamb shoulder delicately crusted with grainy mustard marinade, served on basmati pulao with Indian demi glaze. This dish will definitely leave lamb lovers craving for more, with every bit of it. The meat was succulent and flavourful from its seasoning. After all, what is Indian cuisine without lamb and well-cooked basmati rice? Last but not least was thee heavenly desserts served with a glass of sweet dessert wine. Fig, an ingredient found in both Indian and Western cuisine, was used in the Caramelised Cardamom Fig Tart where cardamom spiced fresh figs top a warm almond marzipan puff tart, served with raspberry sorbet, espresso mousse. The dessert was divine, with all the fig, crispy puff tart and raspberry sorbet complimenting each other. The other dessert, the Indian Spiced Chocolate wasn't overly sweet with a hint of spice making it unique. An alternative choice for dessert is the Fresh Goat Cheese served with Kachamber Salad and Three Valley Dressing, however you must be a cheese lover to enjoy this dish for its richness and acquired taste. Tandoor does not only serve fascinating menu but also a great fine dining experience. Overall, if you’re a Indian cuisine fan, allez-y (go for it). It seems the humble beginnings for Saveur has flourished into a successful exemplification in our local food scene. Nothing has changed nonetheless, even with the newest addition to their Saveur family, their aim still stands to be able to serve affordable and delectable French food at affordable prices. Their newest addition, Saveur Art, is located at level 4 of Ion Orchard - smack right in the middle of town. Upping their game this time, the menu seemingly feels a bit more first-rate, yet reasonably priced. With posh ingredients such as (freshly shaved) black truffle and wild game, the menu definitely feels a notch higher, as compared to their other restaurants. For starters, the Egg Confit and Truffle was truly remarkable. We enjoyed every single bit of the truffled potato mousseline, packed with the texture and crunch from the macadamia nuts, with a lavish amount of freshly shaved black truffle atop. A must-try in our opinion would be the Slow-Cooked Cod in Olive, which was fresh, came perfectly cooked, and moist within. Alongside baby squids, artichokes and paprika foam, we definitely enjoyed the flavours that complimented each other. Another well-prepared dish was the Asian Spiced Braised Short Ribs which was fork-tender and well seasoned, with fresh greens surrounding the very visually appealing dish. We were pretty spoilt for choice after tasting all their desserts, but if we really had to choose which to recommend, the Chocolate and Pistachio wins hands down with a dark chocolate fondant, paired with an in-house pistachio ice cream - it felt a bit like heaven on earth. We were also fond of the Tropical -a passionfruit sorbet served with mango curd, roasted pineapples and coconut sable. Also worth a mention is the dealcoholized wine Saveur Art has to offer, which we think is perfect for lunch dates, or if you need to be behind the wheel. We liked how each plate had a lot of appeal visually, and was faultlessly executed. It is after all Saveur we are talking about, and through the years they have honestly offered nothing else but fine and pocket-friendly French cuisine. First ever Korean tapas bar in Singapore, SYNC is one that offers modern Korean food with a twist. With their first outlet at Westgate, this outlet at Serangoon Gardens gives off a different more laid-back and casual vibe, and has a different menu altogether. On the tapas menu, we especially liked the Cracking, which is basically umami cod chips, fried to golden perfection and pairs perfectly with beer. The Sogogi Jowl, a char-grilled beef jowl in hoba garlic confit will definitely leave beef-lovers craving for more, promising tender slices of beef. Perfect for sharing, the Dak Gar-Bi is a spicy chicken paella with onions, mushroom, cabbage, sasuage and kimchi. Served in a huge pan, we enjoyed the slight spiciness of this dish, as well as the very generous portion. For those who are not a fan of spicy stuff, the Ssam is worth a try, constituting of tender pork ribs, served with lettuce wrap and steamed buns. Apart from they well known lava cakes, a lovely addition to their dessert menu is the Hotteok - a pan-fried chewy sweet korean pancake with banana foster, topped off with a scoop of vanilla ice cream. We found it to be absolutely divine, with all the flavours complimenting each component without being overly sweet. 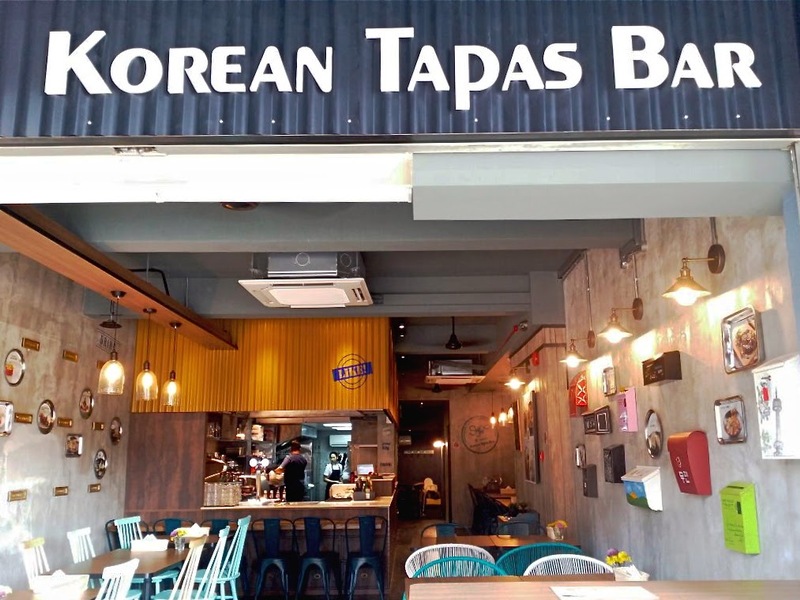 Perfect for chilling with friends or to unwind a long day, we think SYNC Korean Tapas Bar definitely makes a good addition to our ever growing food scene in Singapore. Prices are kept relatively reasonable and there is no service charge. They open till late and also have on-going promotions from time to time. Think about what Subway has to offer, but fresher and better. Toasties is a new sub place which offers subs and wraps that are completely Halal, using only the freshest ingredients and bread that are baked on site daily. The menu is pretty straightforward - choose your bread, fillings, your sides and drinks to make it a complete meal. Their range of bread baked daily includes Crunchy (parmesan and breadcrumbs), Honey Oats, Oregano Parmesan and Premium (white bread). We enjoyed the fluffiness of each so it really boils down to personal preference. For the subs, we tried the Grilled Beef, Italian Trio, Chicken Bacon and Turkey Ham. Our favourite of the lot being the Italian Trio, with a generous serving of salami, pepperoni and beef bacon and fresh greens sandwiched between a loaf of fresh and delicious bread. Apart from subs, Toasties also has wraps, pizzas and salads to offer for those who are just not a fan of bread. We had a go at the pizza which had an ultra thin and crisp base and thoroughly enjoyed every single bit of it, topped with a generous amount of toppings of smoked chicken breast and pepperoni. To complete the meal, one can opt for Nachos, Soup or Cheesy Sausages. We recommend the sausages if you really like your cheese, or the nachos if you are a chips kind of person. As of now, Toasties only has an outlet in the east, and due to space constrain, the place can get crowded and queues may form during peak hours. To be honest, even though Halal does not exactly matter to us, we think we just might ditch the mainstream subs and go for Toasties the next time we need a sub-fix.